The far right’s claim to be attached to ‘Europe’, not the EU, suggests that ‘European identity’ may pose a challenge rather than an opportunity for the European Union. 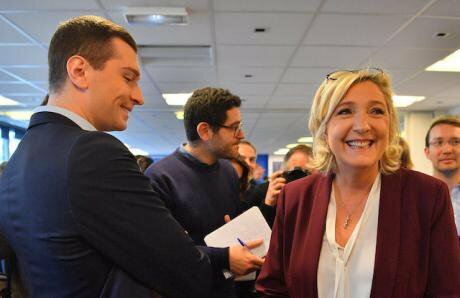 President of Rassemblement National, Marine Le Pen, and her Head of European Elections campaign Jordan Bardella, Nanterre, France, January 17, 2019. Liewig Christian/ Press Association. All rights reserved. The 2019 European elections are set to see an unprecedented number of far-right parties enter the European Parliament. These parties are for the most part rabidly anti-EU, and widely seen as presenting a danger for its future. However, far right parties have a complex relationship with ‘Europe’ that the label ‘eurosceptic’ does not fully convey. Firstly, far right parties have not always been anti-EU. While many of them converged on anti-EU positions, they did not start from there. Both the Italian Social Movement (MSI), a neo-fascist party founded by supporters of Mussolini’s regime in 1946 and which transformed into the conservative Alleanza Nazionale in the mid-90s, and the French Front National (FN, now Rassemblement National), were broadly in favour of European integration in the 1980s, although they were sceptical about the form it took. Guided by their opposition to the Soviet Union and their distrust of American power, the parties saw European unity as a means to defend their homelands and remain relevant in a bipolar world. At the same time, they opposed the primarily economic nature of the European project. Thus, they advocated in favour of a European common defence and a stronger European foreign policy. While for both parties this appeared to be a way to pursue the national interest by European means, it still translated into a form of support for the EEC. This did not survive the fall of the Soviet Union and, most importantly, the signing of the Maastricht treaty. These two events in particular pushed the MSI to a more critical stance, and the FN into an area of firm opposition to the European project. The FN and MSI are also not isolated cases: the Italian Northern League and Austrian Freedom Party (FPO) underwent similar changes in their European policies, moving from support for the project to opposition to it . Therefore, it is worth remembering that far right opposition to the EU is a relatively new feature of the party family. Second, even if far right parties do oppose the European Union, this does not imply that they all oppose it in the same way. If we consider the example of exit from the European Union, this remains a rather marginal position across the European far right. While PVV leader Geert Wilders has famously advocated in favour of ‘Nexit’ (albeit tuning it down in the 2017 elections), the League’s Matteo Salvini has most recently argued for the need to ‘reform Europe from within’ and take back control of the ‘beautiful European dream’. The Rassemblement National, on the other hand, has been shifting position on the issue since 2002, arguing at times in favour of ‘Frexit’ and at other times pushing ‘only’ for a radical reform of the EU. Thus, while most parties agree that the EU in its current shape is unsustainable, they may still live by the claim that ‘another Europe is possible’ – although it is not clear what, exactly, this ‘other Europe’ would look like, and if all parties would agree on its form. Finally, it is worth noting that the far right’s opposition to the EU does not necessarily lead them to reject ‘Europe’. In fact, far right parties’ understanding of ‘Europe’ is grounded in a distinction between ‘Europe’ intended as a continent and civilisation, and the concrete project of the European Union. This distinction, inspired by the French Nouvelle Droite and adopted by the Front National at the end of the 1980s, is still alive and well today in parties that claim to be ‘pro-Europe but anti-EU’. In other words, Le Pen considers that she is allowed to criticise the European Union because she is a true ‘European’ fighting against a ‘fake’ and anti-European EU. Recent research by McDonnell and Werner even suggests that this sense of a shared Europeanness has been conducive to alliances on the far right, worth keeping in mind when following group formations in the European Parliament. These points encourage us to be mindful of the similarities, but also the differences between various European far right parties and their views of Europe. They also suggest that the notion of a ‘European identity’ is no panacea for the EU. While often viewed as a possible solution to the EU’s legitimacy issues, the far right’s claim to be attached to ‘Europe’ against the EU suggests that depending on how it is defined, European identity may pose a challenge rather than an opportunity for the European Union.